The phase III ToGA trial established cisplatin, fluoropyrimidine and trastuzumab as the standard treatment in HER2-positive advanced gastric cancer (AGC). However, as demonstrated in HER2-negative AGC, oxaliplatin-based regimens could improve tolerance remaining effective. The aim of this trial was to explore the potential activity and safety of capecitabine, oxaliplatin (XELOX) and trastuzumab in patients with HER-2 positive advanced gastric cancer. We conducted a multicentre, prospective, non-randomised, non-controlled, open-label and national (Spanish) phase II study. Patients with HER2-positive advanced gastric or gastro-oesophageal junction (EGJ) cancer received XELOX and trastuzumab as first-line treatment. Primary endpoint was objective tumour response rate (ORR). 45 patients from ten hospitals in Spain were included from September 2011 to December 2013. Median age was 65 years, 82.2% were male, 69% had gastric cancer and 31% had EGJ tumours. 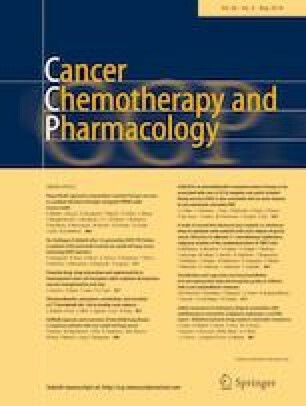 At a median follow-up of 13.7 months (7.1–20.9), the estimated median progression-free survival and overall survival were 7.1 (95% CI 5.5–8.7) and 13.8 months (95% CI 10.1–17.4), respectively, with 8.9%, 37.8% and 31.1% of patients achieving complete response, partial response and stable disease. Regarding safety, 44.4% of the patients had grade 3 or greater adverse events, being the most frequent diarrhoea (26.6%), fatigue (15.5%), nausea (20%) and vomiting (13.3%). Only two patients (4.4%) developed asymptomatic grade 2 left ventricle ejection fraction reduction. XELOX-trastuzumab is a promising and effective therapy as first-line treatment for patients with HER2-positive AGC, with comparable results to the ones obtained with other “platinum-based” regimens. This scheme is feasible and tolerable with a low incidence of cardiac toxicity. We are indebted to the all patients and investigators who have contributed to this study. FR: Advisory boards, conferences, travel expenses and investigational grants from Roche Pharma, Sanofi, MSD, BMS, Merck-Serono, Bayer, Amgen, Servier and Celgene. CL: Advisory boards, conferences, travel expenses and investigational grants from Roche Pharma and Sanofi. JB: Advisory boards, conferences, travel expenses and investigational grants from Roche Pharma, Novartis, Ipsen, Pfizer, AAA and Celgene.